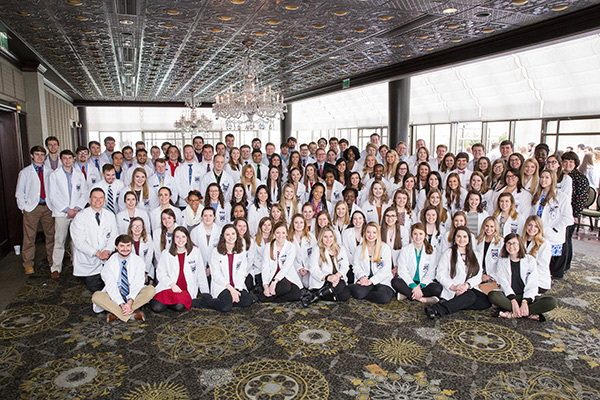 Samford University’s McWhorter School of Pharmacy sent its entire cohort of first year Doctor of Pharmacy students to participate in the Alabama Pharmacy Association’s recent annual Legislative Day in Montgomery, providing many students their first interaction with advocacy. The day included a lunch for pharmacists, student pharmacists and legislators from across the state, as well as time for students to visit legislators’ office and attend meetings. “It is so important that we speak directly to our legislators on topics relating to pharmacists and our patients because we can help them understand a perspective they may not have considered,” said Ryan Oakley, a first year pharmacy student. Oakley is passionate about advocacy as it blends his love for pharmacy with his interest in politics. Though graduation is still a few years away, Oakley says he feels fired up about topics that relate to his future profession, and he is excited about current legislation at the national level, including H.R. 592, which would provide national recognition of provider’s status for pharmacists. Curren said APA Legislative Day was a success because the school’s faculty and staff provided numerous resources ahead of time, educating students on topics that they may be interested in advocating for as it relates to pharmacy. “It is important for us as students to stay up-to-date with what is happening on the state and national level, and as class president, my hope is to provide even more resources and outlets for my classmates to learn more,” he said.